Lanyard cable is passed through the sleeve and fed back through to form a loop on the lanyard end. Sleeve is then crimped tight onto the cable. 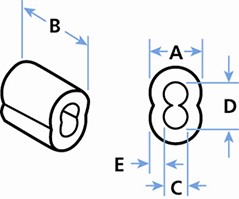 Use loops to attach fasteners, pins or other components; or to loop the lanyard around itself and onto equipment. Contact us for a quote on Stock or Custom Wire Rope Lanyard Assemblies using the loop size of your choosing, as well as other end terminals. Use our Cable Cutter and Crimp Tool when making your own looped assemblies. Lanyard cable is passed through the sleeve and fed back through to form a loop on the lanyard end. Sleeve is then crimped tight onto the cable. 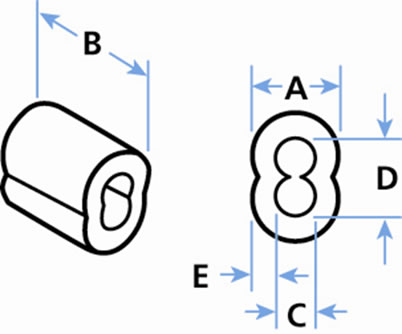 Use loops to attach to fasteners, pins or other components; or to loop the lanyard around itself and onto equipment.